"Man, I hit him with punches that'd bring down the walls of a city," Frazier remarked. "Lawdy, lawdy, he's a great champion." 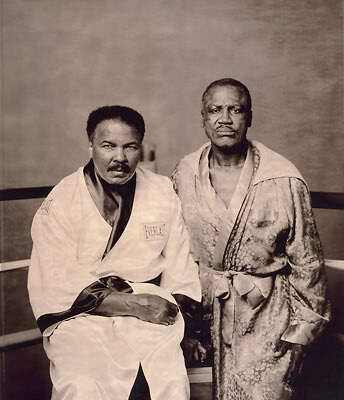 "Joe Frazier, I'll tell the world right now, brings out the best in me," Ali added. "I'm gonna tell ya, that's one helluva man, and God bless him." It was a fight that simultaneously secured their legacies as all-time greats, and signaled the beginning of the end for their careers. It was a battle that for over 20 years held the heavyweight record for most punches thrown in a heavyweight fight. Decades later, both combatants still carried physical and emotional scars from the clash. It was perhaps the greatest heavyweight fight in history. It was the Thrilla in Manila. On October 1, 1975, Muhammad Ali was making the fourth defense that year of his heavyweight title. He had already vanquished three contenders in Chuck Wepner, Joe Bugner and Ron Lyle. Ali had evened the score with Joe Frazier via decision win in 1974, but Ali’s team saw an easy defense and tie-breaker in making this rubbermatch. Frazier had easily took out Jerry Quarry and Jimmy Ellis in recent rematches, but the former champ appeared far less explosive and ferocious than the fighter who turned back Muhammad Ali in 1971. In the lead-up, Ali reignited his taunts of Frazier’s intellect and appearance. Before their 1974 bout, these actions lead to an outside of the ring tussle in front of Howard Cosell. This time, Ali would use assorted gorilla images (mascot, small toy, stuffed animal) to depict Joe Frazier. These techniques only fueled the proud Frazier’s anger to destroy Ali once and for all in the ring. Early in the bout, Joe Frazier was severely outclassed by Ali. The Greatest beat Frazier to the punch constantly, even staggering him in the first round. At times, Ali would mock Frazier by holding his left hand out to blind Frazier’s vision. 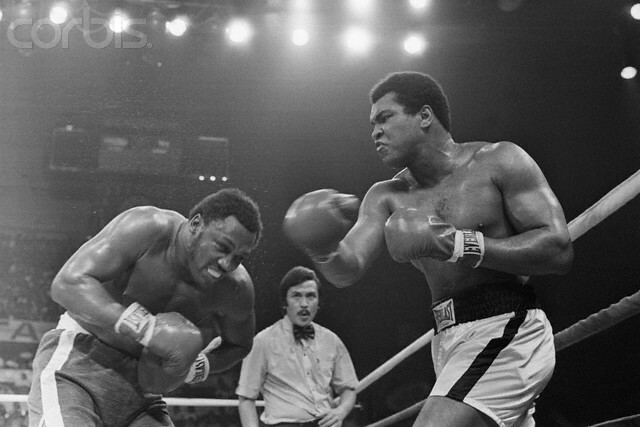 When Smokin’ Joe would swat the glove way, Ali would smash him with a flush straight right. The problem that Ali faced wasFrazier refused to stop coming, and by the middle rounds that aggression started to pay real dividends. Frazier was now breaching mid-range and crashing home snapping left hooks to Ali’s face, and hooks to his body. Ali was now a stationary target, and Frazier punished him as he languished against the ropes. The momentum shifted a final time in the 10th round. Ali amazingly regained his legs and started to fire out sharp left jabs and straight rights to Frazier’s skull. It took only two rounds before Frazier’s eyes were so swollen he could no longer see his hated rival. The champion continued the assault, knocking Frazier’s mouthpiece deep into the audience during the 13th round. Frazier refused to quit, and took another wincing shellacking in the 14th round. Under protests from Frazier, his trainer Eddie Futch stopped the bout before the 15th, awarding Muhammad Ali the most punishing, gutsy win of his career. In the immediate aftermath, both fighters were stripped of their malice towards each other. Time waits for no man, and some old wounds never completely heal. But this day 40 years ago captured all that is horrific and beautiful about the sport of the boxing. And the Thrilla In Manila will hold those lessons forever.